Thomas Edison didn’t invent the light bulb. and powered by the Royal Society’s voltaic pile. and improvements to the technology continued after Edison. to provide direct current for the lights. that electricity could heat a copper wire until it glowed. but it wasn’t bright nor durable enough. an arc lamp, in 1809, using carbon electrodes. but he wasn’t interested in developing or selling it. by running an electric current through a carbon filament in a vacuum. in 1840, but the design was abandoned because of the cost of platinum. got a patent for the same thing, a platinum wire in a vacuum bulb. but the next year he died of tuberculosis. demonstrated incandescent lights at his estate. consisting of a platinum filament burning in the open air. for trying to protect his invention from public disclosure before he could patent it. using carbonized paper filaments in bulbs with a partial vacuum. whose low resistance needed large wires, so was not commercially practical. was demonstrated at the Paris Exposition of 1900.
which had a ceramic filament with a separate heater filament. with a thick carbon rod in a nitrogen-filled cylinder. and sold the U.S. patent rights to Thomas Edison in 1879.
incandescent light bulbs, but improvements continued. created the tungsten filament bulb in 1904.
which lengthened the lifetime of a tungsten bulb. proposed the halogen lamp in 1933, and GE improved it in 1959.
had to screw in, too. The E26 screw became a standard in the U.S. by 1908. The ‘E’ stands for Edison. 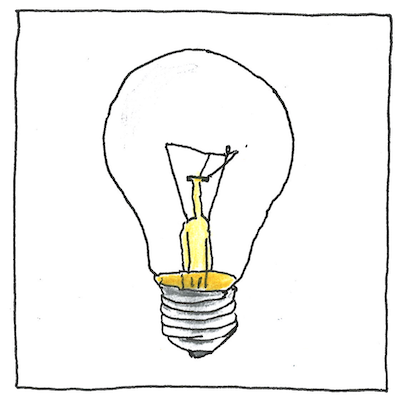 Simplification of history involves forgetting details, a natural consequence of the perspective of time, so that it seems as though Edison invented the light bulb.